Note to Members : Additional 'Member only' events are displayed here ONLY when you are logged in. Click on event for details. This race is for the Blackwater Cup, start time 08:30 at the Marconi start line. HW Osea is 06:20. The first BSC cruiser not winning the Blackwater Cup is awarded the Norman Eve Cruiser Cup. The Blackwater Joint Racing Committee promotes and coordinates joint club cruiser racing on the Blackwater Estuary. Our Main series is the 9 race Cruiser Racing Series for local handicapped and IRC rated boats. The BJRC fleet of cruisers comprises of boats ranging from under 20 foot through to 40 footers. Many of the fleet are lifting or shallow keel boats as required of their upriver moorings, but there are also boats with 2 metre plus drafts. For those racers that favour seeing their performance scored using the IRC rating system, all boats with a valid rating certificate will be scored on a separate IRC results sheet. Come along and make the most of the last two days of the early May bank holiday and take part in this four race series which is for Blackwater Sailing Club dinghies. There will be separate long and short course races and competitors can race with either fleet. There will be four races with three to count. Cadets are welcome to enter. This race is for the Smith Cup, start time 08:30 at the Osea Pier start line. HW Osea is 06:30. This race is for the Marconi Cup, start time 08:30 at the Marconi start line. HW Osea is 06:21. What better way could there be to spend a bank holiday Monday than to catch the morning tide and cruise in convoy with our Commodore to his chosen exotic location on one of the many idyllic, sun drenched beaches that line the Blackwater Estuary. As part of their "OnBoard" programme the RYA Eastern region have offered to run a day course for instructors for us here at BSC. It is thought that this would be a good refresher for those that have taken their DI training and offer a reminder of the different things we can do when instructing both for DI's and race coaches. We have decided to take up their offer and this is provisionally arranged for Saturday 1st June if there is enough interest. It will be mixed day of theory and practical and be free of charge. Places are limited to twelve so please let me know if you would like to come. This race is for the Stone Cruiser Cup, start time 08:00 at the Stone start line. HW Osea is 05:30. This race is for the Brown Cup, start time 12:30 at the Osea pier line. HW Osea is 10:40. 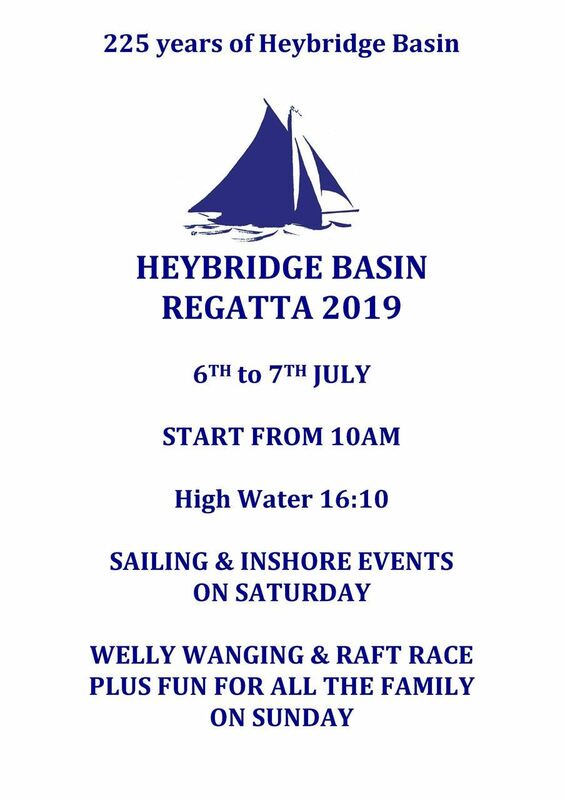 The Committee has granted the Maldon & Blackwater Model Boat Club sole use of the lake on Saturday 6th July 2019 for their annual regatta. Please would members refrain from using the lake on this date. Don't miss one of our top 'all-in' general handicap dinghy races of the year and support the RNLI in the process. There is a 'voluntary' entry fee of what you can afford and this all goes to the RNLI. The long race goes around Osea Island and Northey Island and there will be a short race around Northey Island. The winner of the long race is awarded the Jubilee Goblet with the runner up awarded the Vincett Wings. The round Northey Spoon is awarded for the helm of the first dinghy with a PN over 1250 in the round Northey race. Competitors can race with either fleet. Cadets are welcome to enter. For the long race, the medium handicap fleet will start at 14:30 with the faster boats starting 20 minutes later at 14:50. The round Northey race will start at 14:53. This race is for the Paget Cup, start time 10:30 at the Osea pier line. HW Osea is 08:30. Don't miss our annual Pursuit race which is for all Blackwater Sailing Club dinghies and cruisers. Cruisers receive a 15% allowance on their handicaps. The slowest boats start at 13:30 with others starting at the TBC times according to their handicap. Cadets are welcome to enter. This race is for the Maldon Salver, start time 11:00 at the Osea pier line. HW Osea is 08:50. This race is for the Freeman Cup, start time 09:00 at the Osea pier line. HW Osea is 06:30. This is the first leg of the passage race to Harwich. This race is for the Success Cup, start time TBC at Harwich. This is the return leg of the passage race home from Harwich. Our annual Optimist Open Meeting. Come along to take part in this general handicap dinghy race for the Blackwater Challenge Cup and the Short Course Blackwater Challenge Cup. This race is open to sailors from clubs on the Blackwater. There will be one race with separate long and short courses set and competitors can race with either fleet. Cadets are welcome. This race is for the Krohn Cup, start time 10:00 at the Osea pier line. HW Osea is 08:00. The joint Blackwater clubs combine for this annual world wide event in memory of Andrew 'Bart' Simpson. There will be a long race around Osea Island for dinghies and a short course race in the vicinity of Osea Road. There may be a cruiser race, subject to demand. Cadets are welcome to enter. Registration should be available nearer the time on the Bart's Bash BJRC signup page. Entry is free but participants are encouraged to make a donation to the Andrew Simpson Foundation to help them to deliver on their mission of increasing participation in sailing and improving the lives of young people through the delivery of 5 key charitable activities. This race is for the Weathermark Trophy, start time 08:30 at the Stone line. HW Osea is 06:00. With the end of the 2019 sailing season approaching, come along to take part in this popular annual general handicap race which is open to cruisers and dinghies helmed by sailors from clubs on the Blackwater. The winner is awarded the Dyer Cup, the first BSC helm not winning the Dyer Cup is awarded the Fendick Cup and the first cruiser helm not winning the Dyer Cup is awarded the Copsey Cup. Cadets are welcome to enter and of course won in 2018! Subject to demand, there may be a separate short course Dyer Cup option. The race start is 12:15 and is usually a committee boat start in the vicinity of Osea Road. Maldon Little Ship Club extends a warm welcome to all BSC Members to support their sponsored rowing and gig race on Saturday 28th December 2019 in aid of the RNLI.